Notmartha's kitchen is possibly the most well-designed DIY kitchen venture I've seen yet. The brushed steel finish, the cables: its sleek, stylish, simple and well made. Yes, Martha would be jealous, except that her new kitchen featured in the September '06 Living issue is pretty hot. Of course, she has a close-by conference table that seems to seat the army comfortably. So what I am saying is, if your house is less than 5,000 square feet go more for Notmartha's kitchen and not Martha's kitchen. The same does not go for my kitchen. You do not want the current state of my kitchen. It is country, vintage, modern and cluttered. It also has vinyl floors and a grayish blue laminate countertop. 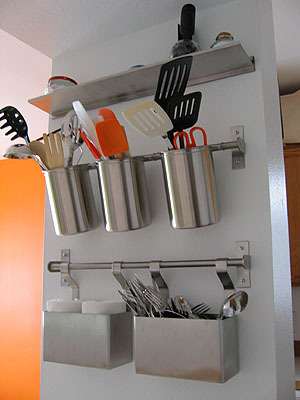 Just look at this organization in all of its brushed steel beauty. i too have vinyl. i empathize.